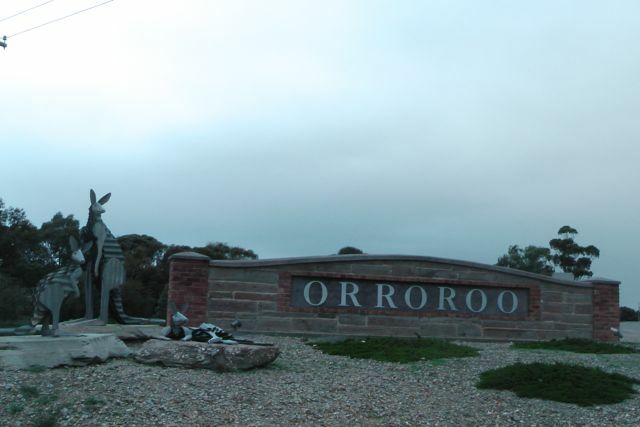 After arriving in Orroroo and booking into the Orroroo pub, I enjoyed a few bundy & cokes, and a beautiful kangaroo schnitzel. 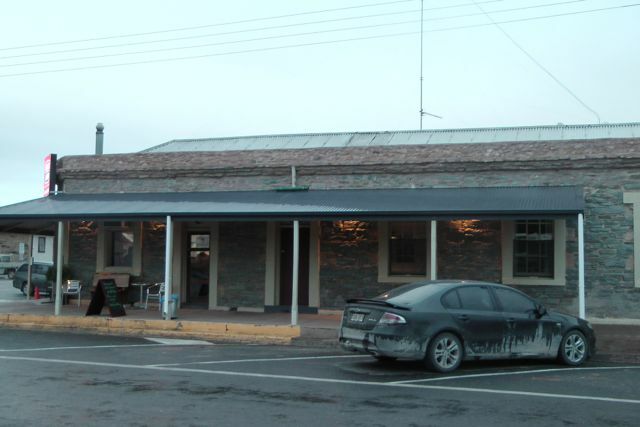 This pub is a terrific little country hotel which was built in 1877. Warren & Liz Campbell are the licencees and they took on the oepration of the hotel just 18 months ago. They opened up the accommodation at the hotel, which had not been in operation for about 25-30 years. 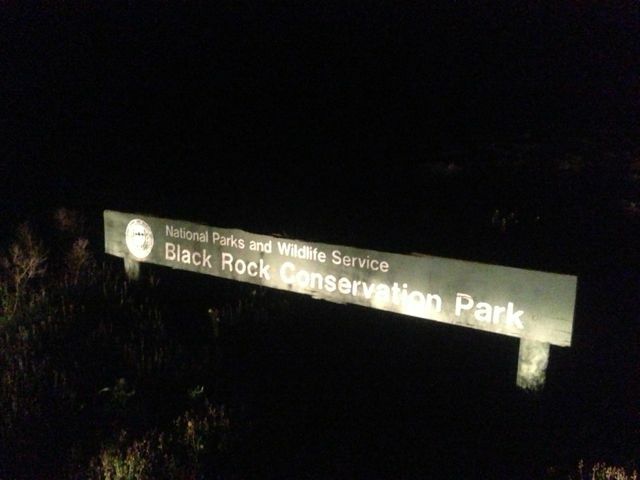 After dinner, I decided to drive 25 kms east out of town to the Black Rock Conservation Park. Access to the park is via the Paratoo Road. The park is 170 hectares in size and has excellent examples of the flora of the area, and is dominated by the Black Oak and Bluebush. The park has several creek beds with steep banks which are perfect nesting places for Red-back Kingfishers and Rainbow Bee Eaters. Unfortunately I didn’t get to see those because it was dark when I arrived. 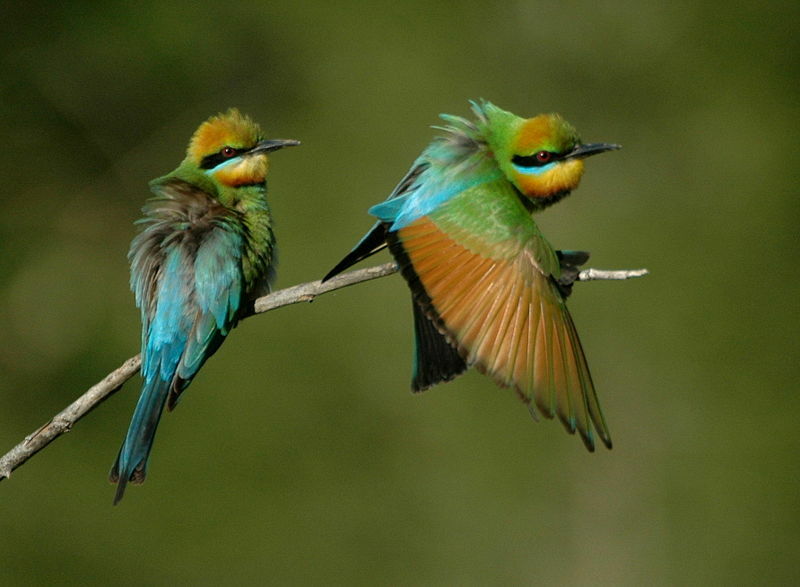 But below is a picture of what a Rainbow Bee Eater looks like. They are a spectacular bird. I found an access gate at the south eastern end of the park, which unfortunately was locked. So I put on my headlamp and walked into the park with my gear and my deckchair. 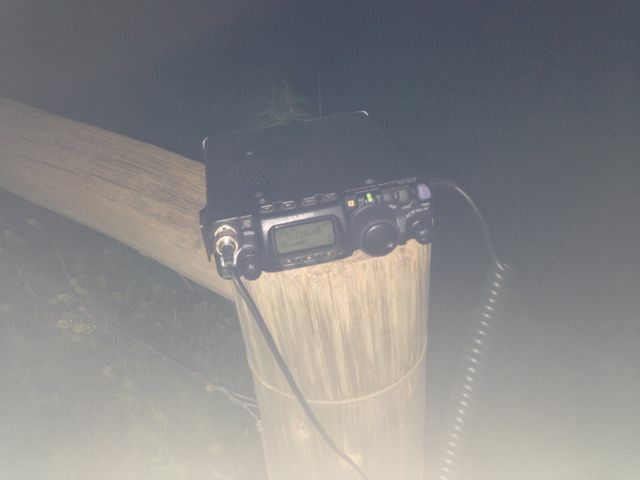 I used a permapine log fencepost to prop the radio on and set up my 40m/20m dipole on the 7m squid pole. I tuned across 40m and could not hear any VK’s at all. I could hear quite a lot of North American DX but knew that with my meager 5 watts and dipole, I would be pushing the proverbial uphill. So I booked in to the 7.130 DX Net. Unfortunately conditions were not great, but I did work Roy VK7ROY; Andy VK4TH in Kingaroy; John VK2FALL; Ian VK2IW who was qrp; and John ZL2BH. The contact with Ian, VK2IN was particularly rewarding though. Ian was using just 6 watts and a vertical whip in the lounge room of his house. He was a good 5/4 signal and I received a 5/7 signal report back from Ian. I also would like to thank John ZL2BH for his persistance. John and I tried about 6 times during the net to get through to each other, but to no avail until the very end. John was an excellent 5/8 signal and my signal when he first heard me was also strong. But by the time we got to call each other the band conditions had changed and we could not make it. But on our 7th attempt my signal had come back up out of the noise and we managed a good quick QSO, with 5/8 exchanged both ways. I could hear all of the DX on the net, including William FO5JV in French Polynesia, Bill W1OW in Massachusetts, Juan YV1FPT, and ZL’s. But sadly, as is the case almost every night on this DX Net, the Indonesians were causing massive QRM. They were playing music, laughing, and burping. There is no doubt that they can hear stations on the DX Net, but they simply do not seem to care which is a real shame. Something really needs to be done to fix this ongoing problem. At the end of the net, I headed back to Orroroo and enjoyed the rest of the evening watching the AFL and the cricket on TV before getting a good night’s sleep for the next day’s 2 SOTA activations. Next time I come to this park, will be the day time, so that I can explore the park a bit.